Jersey Shore Boca standout Danny Haydu announced today that he has verbally committed to attend Monmouth University and will sign a National Letter of Intent during the NCAA men’s soccer signing period in February (Photo Credit – MVP Photos, NC – Meg Daniels). TOMS RIVER, NJ (December 1, 2003) – Jersey Shore Boca standout Danny Haydu announced today that he has verbally committed to attend Monmouth University and will sign a National Letter of Intent during the NCAA men’s soccer signing period in February. He will continue his soccer and academic career under Hawk’s Coach Shannon Poser at the Northeast Conference Division I school in the fall. The senior defender from Toms River East High School chose Monmouth over the University of Massachusetts, Long Island University, University of Charleston WV, Mulhenberg College and Stevens Institute of Technology among others who were recruiting him. At the club level, Haydu is a long-time member of the Jersey Shore Boca soccer club and youth program. He is also a two year member of the elite Super Y-League and competed with the Boca SYL teams against some of the top young soccer talent in the United States. Haydu, who stands 6’1″ and weighs 175 lbs, is a tough central defender and is expected to play that same role for Coach Poser and the Hawks next year. “Danny has a real passion and desire to succeed at the highest level of soccer that he can. He has an excellent individual work rate, good size and skills and is a natural leader. He is also a very respectful and mature young man off the soccer pitch. Danny is the type of player that all college coaches would love to have on their roster. He was a pleasure to coach” said Walt Konopka, a member of the Jersey Shore Boca Board of Directors who also coached Haydu on the Boca club and Super Y-League teams. “I believe Danny has made an excellent choice in Monmouth University. I am extremely happy and excited for him. After he gets his feet wet a little, I know that he will make a substantial impact on the field for Monmouth” Konopka finished. 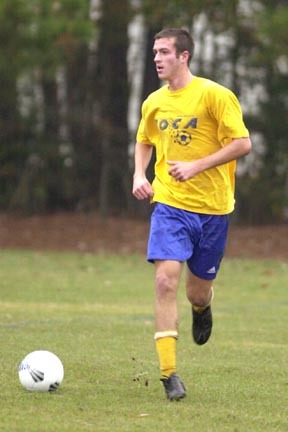 Throughout his club career, Haydu propelled his Boca teams in numerous state, regional, and national competitions including back-to-back visits to the First Union Raleigh Shootout in Raleigh, NC, one of the most competitive collegiate recruiting tournaments in the nation. At the high school level, Haydu was a three-year varsity starter for Coach John Crowley and the Raiders of Toms River East. He was named team captain in his senior year. Haydu scored three goals and handed out three assists for the Raiders as a senior. For his career, the defender tallied 7 goals and 9 assists while at Toms River East. Academically Haydu maintains a 3.30 GPA at Toms River East and ranks in the top 20% of his senior class of 425 students. He is also a member of the History Club and lettered in both indoor and outdoor track. He plans to pursue a major in Criminology at Monmouth. Monmouth University finished the 2003 men’s college soccer season with an overall record of 4-11-1 and 3-6-0 in the Northeast Conference. Shannon Poser was appointed the seventh head men’s soccer coach in Monmouth history on March 1, 1998. He completed his sixth season in 2003. The Jersey Shore Boca soccer club has been a fixture in the soccer community since 1978 and is one of the most respected soccer clubs in New Jersey. The club is celebrating its 25-year anniversary in 2003. The club will compete in the United Soccer Leagues elite Super Y-League for the fourth straight year in 2004. Boca is the only soccer club from Monmouth or Ocean County (NJ) that is a member of the Super Y-League. Boca was also a member of the United Soccer Leagues Premier Development League in 2003.